The leaning Kiipsaare Lighthouse (Kiipsaare Tuletorn) is slowly disappearing into the sea. The lighthouse was built on the Harilaid peninsula in 1933 at 25 meters from the coastline. 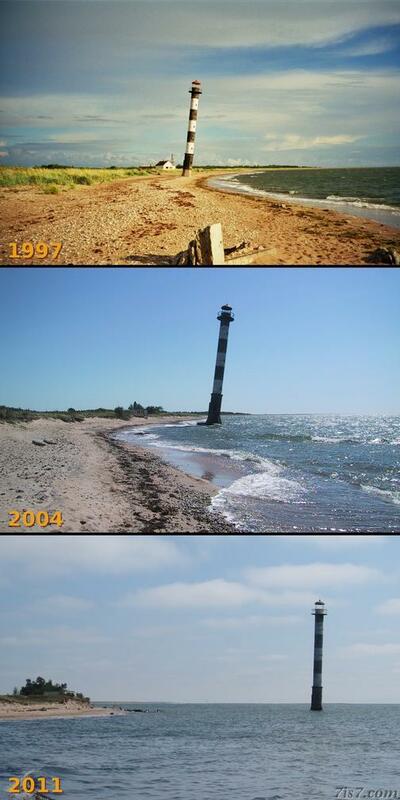 On the photos below you can see how the coastline has evolved between 1997, 2004 and 2011. In 1997 the lighthouse was leaning but still on the beach, in 2004 it was already in the sea and seemed to lean even more. In 2011 it was far in the sea, but leaning a lot less. In 2004 I wondered if my visits to the lighthouse were going to become a 7 year ritual, although we revisited in 2007, we did revisit 7 years after 2004 in 2011. I am pretty sure we will continue to revisit the lighthouse as it seriously is something that we would like to follow. In 2004 I expected the lighthouse to fall over one day as it was leaning more than in 1997. However since it's now leaning less that prospect seems to have diminished. Seen from the other side the coastline seems to have retreated even more. In 2004 you also got the impression that the lighthouse was leaning more than in 1997. The little house behind the lighthouse, that used to be the lighthouse keeper's home has also been destroyed in the meantime. In 2004 it was already impossible to get a photo from the same angle as in 1997 in 2011 even more so. Location: 58°29'45"N 21°50'28"E on: Google Maps, OpenStreetMap, Maa Amet.